Casa Lucía v Managua, Nicaragua: Zarezervujte nyní! We are located in the heart of Managua in front of Los Robles Park conveniently located for restaurants and the main bus stops. We are passionate about sharing our culture and local knowledge, and coffee too that’s a very important part of life. 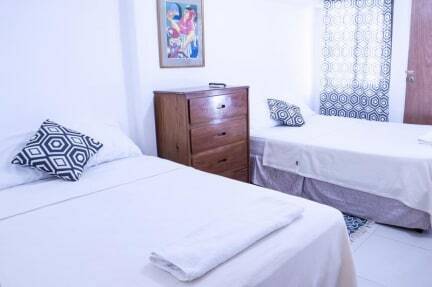 Our guest can select to stay either in a single or a double private room which are provided with free breakfast , Wi-Fi, flat-screen cable TV, air conditioner a private bathroom and shower with fresh clean towels. Rooms also include a desk if needed .We also offer you free parking. There are also some shared facilities like a living room, patio hammock, terraza , kitchen & fridge. -Private Tours: Get the real experience of Nicaragua, travel with us to the best known and hidden places. Get to know the best local hot spots. Don´t be a tourist, be a traveler. Prices are set based on distance, hours, and number of people. -Free Luggage storage: Are you going to Corn Island and need to leave a bag behind? Don´t worry, we value a loyal customer and we will be glad to take care of your bag while you are traveling light. Either if you’re planning on traveling around Nicaragua, visiting Managua on a business trip, or seeking to know about the night life in Managua we will be more than glad to have you as our guest. 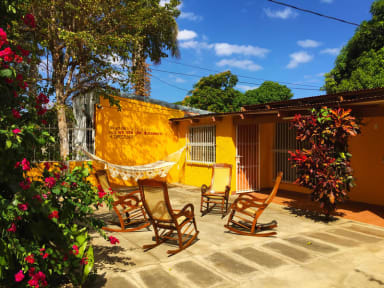 Here you will find not only a place to stay but a friendly staff that will help you and give you a word of advice in whatever you are planning to achieve during your trip to Nicaragua. For late check in we would appreciate you telling us in advance.